RegTech One, the ‘Power of Everything,’ provides a single platform from which to run multiple regulatory compliance programs at institutions of every size. With API installations and configured workflows—default or customized—RegTech One provides a single platform for every eGRC need, including end-to-end AML/CTF, CECL, FCPA, vendor management, cyber-risk assessments, and other RegTech or Business Process Management requirements. What can One do for you? What can One do for you? AML Partners engineered RegTech One to be endlessly configurable, scalable, and API-ready. 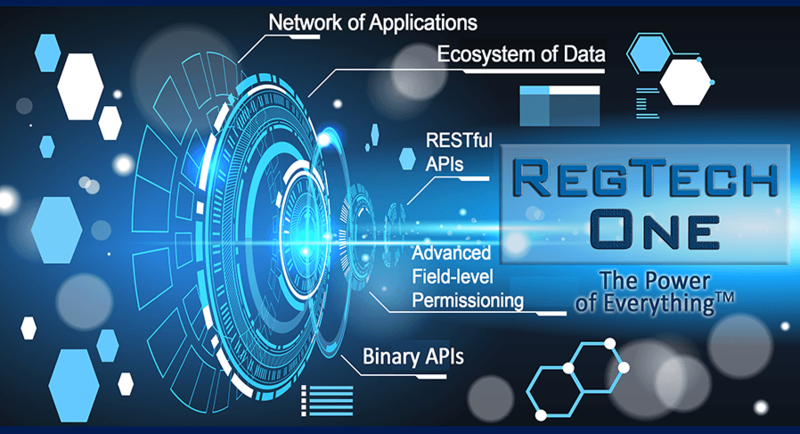 Leveraging the API Economy and infinite user configurability, RegTech One provides a platform for every eGRC requirement—both today’s and those yet to come. With embedded ‘Comply on the Fly’ technology, RegTech One users adapt, extend, and customize their system at will—in-house at any time. And RegTech One facilitates transparent knowledge sharing across the enterprise by integrating disparate data sources such as Content and Relationship Management Systems, core banking systems, and 3rd-party data systems. With drag-and-drop-configurable event and action engines, RegTech One users analyze, inform, and act—with real-time data across the enterprise. The RegTech One platform is ‘The Power of Everything’: Users create event libraries that trigger searches for those events across the enterprise. Using the exact same interface, users configure what action will happen based upon each event’s occurrence. With RegTech One’s action and event systems and the WYSIWYG graphical interface, users design workflows to facilitate complete knowledge transparency across their enterprise. And RegTech One is fully horizontally scalable. The following default workflows are included with purchase: AML/CTF Ecosystem, Vendor Management, Employee On-boarding, CECL, and Foreign Corrupt Practices Act. Other workflows are in development, and each institution may create its own—for any process, any task, any risk, in any language, anytime, anywhere.